“How would you like to design and build a sustainable school in Uganda”? Not the sort of question that you expect to be asked at an Awards ceremony; but then the 2Degrees Awards are not your run of the mill event! The person asking the question was Alison Hall of Seeds for Development and Pop-Up Foundation. She and Paul Clarke were very happy because they had just picked up their awards for Solution of the Year; I on the other hand was not; as I had not! So we started working with Alison and Paul to design the school to be built on a site in Arugudi Village, Northern Uganda. From the first discussions it became clear that there was a powerful meeting of minds about how the school should be conceived. We wanted collectively to create an enduring, local solution that the community could build, maintain and run, using locally sourced and easily available materials and technology. We wanted to develop and improve upon the existing vernacular architecture, breaking the colonial tradition of breeze block and wriggle tin that dominates most local school design. We were also keen to avoid too much architecture and wanted to strive to find simple easy and efficient solutions to problems, so that we could provide an adoptable precedent that could be applied by other communities throughout the region. It quickly became apparent that one of the biggest challenges would be around water and sanitation. It has long been recognised that female education is the key to unlocking development, yet currently most girls leave school when they reach puberty due to a lack of basic sanitation. One of the first actions in making the school will be the sinking of a borehole to provide a supply of water for drinking and personal hygiene. Human waste is a major health hazard, so we have developed the design of the school around an anaerobic digester that will process this material, from hazardous waste into a series of useful nutrients. Solids and liquids will be turned into fertiliser, used to grow crops that will provide lunch for children. The methane gas from the process will be collected and used to cook lunch, removing the need for timber or charcoal for cooking. The school buildings will all be built by the community and their design has been heavily influenced by the local vernacular tradition of simple circular huts, with “adobe” earth walls and conical thatched roofs. We believe that it is essential that local, freely available materials are used, so that the environmental footprint of the development is minimal, material costs are virtually eliminated and the skills and knowledge of local people are valued and developed. However, this philosophical approach presented a significant challenge, since during the recent armed conflict many people were injured or killed when the thatched roofs of their homes were set on fire with them in them! There is now strong resistance to thatch and we are exploring other alternatives, including exploring the use of fast growing bamboo to form both the roof structure and make bamboo roof tiles, due to its inherent fire resistance. To help simplify and speed up the adobe wall construction we are developing a simple hand press that will produce regular shaped and sized mud bricks that can either be dried in the sun or using a parabolic solar oven, that can also be used to cook food once construction is complete. The classrooms are hexagonal spaces capable of accommodating 50 children each, arranged in clusters of five to allow one teacher to oversee up to 250 children when necessary. 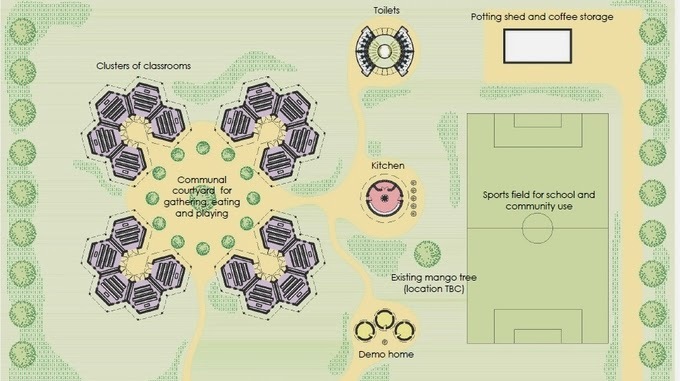 The space enclosed by the classroom cluster will be shaded by a tree to create a cool external shared amenity space, with large over sailing roofs reducing solar gains and providing shelter from monsoon rains. Light will be provided within the classrooms by plastic water bottle rooflights that refract natural light through water to produce the equivalent of 50W light bulb. The school site will also include a demonstration home where the community will come to learn about how they can reduce their impact through the adoption of new technologies like solar stoves, improve sanitation by installing simple tip taps so that they can easily wash their hands and learn to make and install water bottle rooflights. So after nine months of research and development I shall be leaving for Uganda on Sunday. I have had my jabs, started taking my malaria meds and am feeling both nervous and excited. It will be my first visit to Africa and I am sure that I will learn a lot in the week that I am there. One thing is certain, the discipline of designing using local materials and labour will certainly provide valuable learning that we will apply to projects at home. Just imagine what our economy and buildings would be like if we could only use locally available labour, materials and technologies?